Added on March 31, 2019 by Kenzie Adair. Momentum is an annual exhibition of Oklahoma artists ages 30 and younger organized by the Oklahoma Visual Artists Coalition (OVAC). Every year the exhibition takes place in a different venue, and this year it was held in The Womb gallery of Factory Obscura in Oklahoma City, which is an immersive art collective founded in 2017. My mixed media pieces Estuary, Sundae, and Early Dew were on display, and Early Dew was awarded Honorable Mention from the OKC Marquee. It was an incredible show with 67 works in all mediums by 41 young artists representing Oklahoma’s emerging talent! Here’s a short video clip of my work at Momentum 2019 with local band Flock of Pigs grooving in the background! Added on November 16, 2018 by Kenzie Adair. 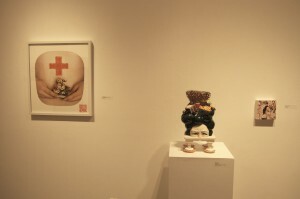 My exhibition Knee Deep at the SCAD Museum of Art, which went up on August 14th, came to a close this month. If you missed it, check out my interview with Rachael Flora at Connect Savannah who covered the show here! Added on May 11, 2014 by Kenzie Adair. Added on March 1, 2014 by Kenzie Adair. "Non-Fiction presents Curious Deviations, a juried exhibition of 27 artists exploring the concept of the uncanny. Through diverse style and medium, the artists encapsulate both the familiar and strange, feelings of tension, eeriness, or disquiet." Unfortunately I could not attend, as I was beginning my semester abroad in Lacoste, France. However, I was ecstatic to receive news that the jurors awarded my piece Honorable Mention! The award was icing on the cake of a truly great experience showing alongside 26 fantastically bold and talented artists. "It is my opinion that this is one of the most conceptually successful shows I have yet to see in Savannah’s independent galleries...this is a must-see stop on Friday’s Art March; it is rich, diverse, and will definitely command your imagination"
"Throng Kim’s Disco Mind, Zhenjie Dong’s Pixie and the Red Cross Society of China and Kenzie [Adair]’s Ladylike deal with themes of mystery and the eeriness of untold identity. 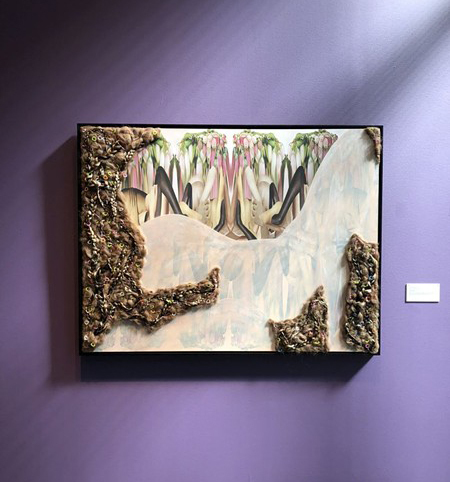 [Adair]’s piece seems to offer some nebulous feminist commentary, perhaps referencing Hannah Wilke’s Starification Object Series with its similar chewed gum motif obscuring the identity or beauty of a woman." Overall, being a part of Curious Deviations was an honor, a great experience, and great way to debut the new direction of my work. Special thanks to Everyone at Non-Fiction Gallery and Art Rise Savannah for everything you do to support artists and expand the arts in general!